All right, reach for the sky! Blast them to high heaven with this Tommy Gun Toy! It’s a must have for your gangster costume and the most effective way to show them who’s the boss. SKU: 503365182 Categories: 20's Costumes, Gangster Costumes. Tag: Gangster Accessories. Do you have your crisp, Italian-cut suit ready? Do you have your flower lapel pinned? How ’bout your leather shoes shined? And still you feel like you’re missing something? That’s because no gangster costume would be complete without the classic Toy Tommy Gun. Now you can take your “Chicago Typewriter” and embody the look of the the old-timey bootleggers of the 1920s. Keep an eye out for Eliot Ness and his boys, because they’ve been hot on your trail for a while now. Lower your hats and keep your suits clean and give the boys the slip along Madison Avenue. 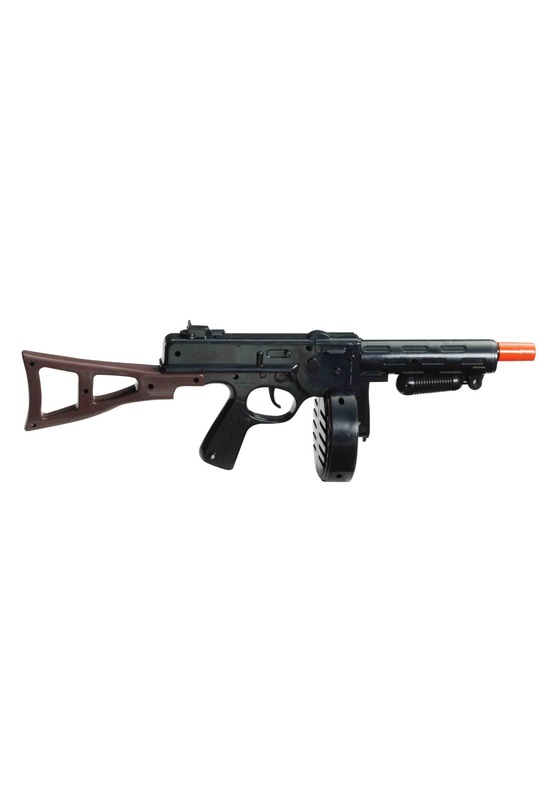 This Toy Tommy Gun has a brown stock, black barrel and orange tip. About 19” long, it makes a rattling firing noise when the trigger is pulled – perfect for your and your friends to enact your great escape from the Untouchables as they attempt to raid your best Speakeasy. Just be careful not to ruin your “merchandise” in all the action.